Stringent environmental emission regulations mandate that industrial facilities curtail the release of volatile organic compounds (VOC) with vapor emission control systems. Vapor phase activated carbon adsorbers are ideal for eliminating or minimizing the emission of VOCs from atmospheric tanks or process vents. Since every facility is different, no single solution is a fit for every factory. TIGG’s experienced engineers can design vapor phase activated carbon adsorption systems to remove contaminants from vapors exiting atmospheric tanks during filling operations and diurnal temperature changes. Not only do these vapor phase adsorbers curb VOCs, facilities that use thermal oxidizers as their primary VOC containment solution can realize cost savings by adding activated carbon adsorbers to capture emissions during non-peak emission times. The cost of using natural gas to incinerate VOCs can be expensive. Vapor Phase adsorbers are cheaper to maintain and electric blower systems are the only component in the process that requires power. TIGG has a wide array of vapor phase activated carbon adsorption options available, ranging from 55-gallon drums up to integrated adsorption systems capable of handling flow rates up to 20,000 CFM. Our integrated vapor emission control systems can include intricate pipe rack set ups as well as blowers and electronic control panels. A major chemical plant wanted a backup for a thermal oxidizer treating gases vented from a tank containing a light hydrocarbon product. 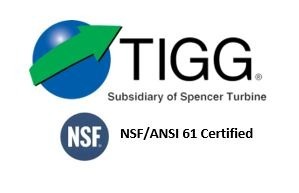 TIGG provided two ASME Code vessels containing 2000 pounds of carbon that will treat 167 ACFM of tank emissions during tank filling when the oxidizer is offline. A Northeast chemical company was experiencing operating difficulties with their RTO and had to shut it down for four to six weeks to make repairs. To keep the chemical plant running during the repair period, the air permit requirements on the 11,000 CFM contaminant stream still had to be met. A temporary solution was needed. The next day, two TIGG NB 20s, each loaded with 20,000 lbs of activated carbon, flexible duct and an air handling system, were on the road and delivered to the site. On-site carbon exchange and disposal services were also performed due the high concentration of organic compounds in the air stream. The temporary system worked as predicted and kept the chemical plant running around the clock until the RTO was back online. A Gulf Coast Refinery needed to control emissions from a process tank. The tank vents intermittently due to fluctuations in tank levels and/or process conditions and contains traces of hydrocarbons, hydrogen sulfide and condensing water vapor. A hydrocarbon processing plant required a system to remove VOCs from a spent caustic treatment tank. Due to level changes, vapors containing hydrocarbons are released from a layer of organics that form in the tank. 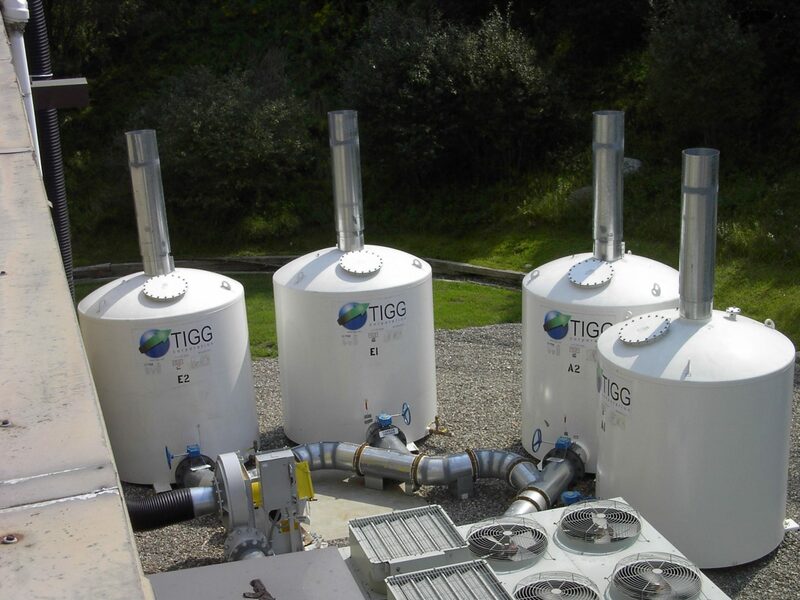 TIGG provided an adsorber vessel with a stainless steel distributor containing 2,000 pounds of activated carbon to control emissions. A refinery required immediate, temporary control of hydrocarbons vented during high volume product transfers between transport tankers and the terminal’s storage tanks. In less than 24 hours, an NB20 containing 20,000 pounds of activated carbon was delivered, installed and placed into operation. As a result, the client avoided permit violations and was able to complete the product transfer.